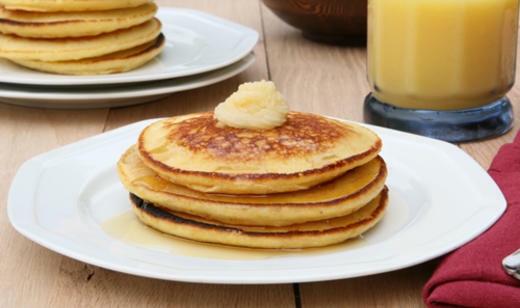 This delicious pancake recipe is a honey-sweet way to begin your morning. It’s easy to make and gives you an alternative to boring box pancake recipes. Preheat a large sauté pan or griddle over medium-low heat. In a medium-sized mixing bowl, combine orange juice, 1/4 cup honey, lemon zest and egg. Use a whisk to make sure ingredients are mixed well. In a separate mixing bowl, combine dry ingredients (flour, cornmeal, baking powder and salt). Add the dry ingredients to the wet ingredients using the whisk to make sure mixture is combined. In a small bowl, combine softened butter and honey, and set aside. Add a small amount of vegetable oil to the preheated pan or griddle. Using a 1/4 cup measure for each pancake, carefully pour batter into pan or griddle. Cook the pancakes until they start to bubble on the uncooked side, about 2 to 3 minutes. When the bubbles start to appear, flip each pancake in the pan, and let cook for another 1 to 2 minutes. Repeat cooking procedure until all the pancake batter is cooked. Serve pancakes warm with the honey butter.